As reactions continue to trail a recent statement attributed to Col. Ojogbane Adegbe, former aide-de-camp to immediate past president, Goodluck Jonathan, the military personnel has debunked ever threatening to open a can-of-worm about his erstwhile principal. Col. Adegbe, while expressing shocks and disbelief over the recent viral report, which quoted him as saying that if he was forced to reveal what transpired under the last administration, Nigeria will boil, had demanded an unreserved apologia from the management of the Sun Publishing Limited for dragging his hard-earned name to the mud. He said his recent visit to the office of the Economic and Financial Crimes Commission (EFCC), was never in connection with the controversial arms scandal. 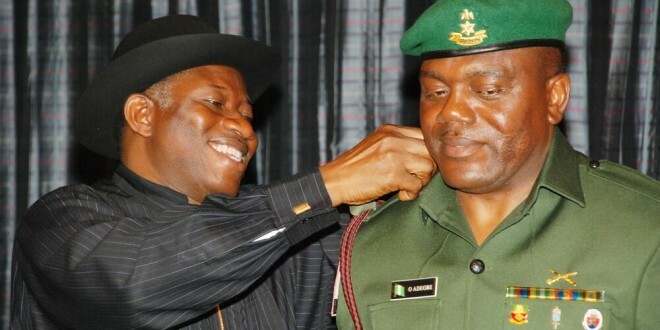 Reacting to the report, the military official in a letter by his solicitor, Chief Ogwu Onoja, SAN, and exclusively obtained by DAILY POST, denied ever making such controversial statement against his former boss during his interrogation at the EFCC office. According the letter, “We have read with shock and disbelief the lead story in your newspaper, dated Friday 12th February, 2016, titled: “If I open up, Nigeria will burn. Detained Jonathan’s ex-ADC warns, as EFCC declares Tompolo wanted” . The lawyer, while describing the report as false, misleading and defamatory, said it had caused significant harm to his client’s good name and reputation. Explaining the real reason for his invitation to the anti-graft office, the solicitor noted that, “to set the records straight, Col Adegbe was not arrested by EFCC as claimed by your newspaper. It is known fact that Col Adegbe has been in the UK for studies having been released by the Nigerian Army to do so.